Embellishing your sewing projects with lovely stitched flowers and geometric designs is a breeze with the Flower Stitch Attachment. It is available in low shank, and I was able to use on my Baby Lock Embroidery machine using my low shank adapter. 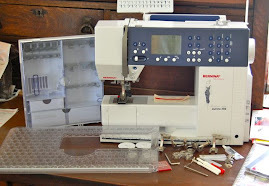 The same is for Bernina machines - check your manual to determine what you need. Use it with the feed dogs lowered and a decorative stitch pattern. You can further adjust the size of the flower using your stitch width selector. Attach the foot to your machine, tightening sufficiently. Lower your feed dogs. If you can't lower them on your machine, try covering them with tape. 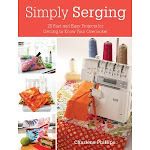 Either sew on two layers of fabric or use a tear-away stabilizer underneath the fabric. I used felt for my coasters and it was sufficiently heavy enough. The instructions state to set your needle position to the left. I did not do this on my Babylock and had no trouble. Check your needle position to ensure it is not hitting the actual attachment, and move accordingly. 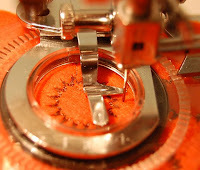 Reduce your top tension thread to between 3 and 3.5 - you don't want the stitching to pull. Select your stitch pattern and set to the widest stitch, if you wish. Play around with your various stitch patterns. You will be amazed at what they look like using the Flower Stitch. Try going around your patterns several times, or more. This creates more color AND at times, will give you a new stitch pattern. You can also use a twin needle and decorative threads. 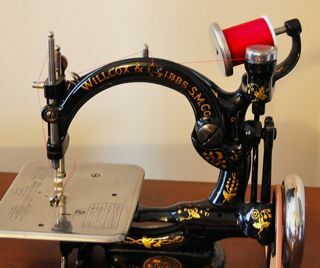 Use a different color thread in each needle. Always try on a sample first. Look at the front of the flower stitcher and you will see a "pointer". The closer this pointer is to the minus sign, the smaller the flower. The closer to the plus sign, the larger your flower. You can make flowers as small as 3/8" and up to 7/8". Cut a piece of felt about 5 x 5 inches. Focusing on the center area, stitch out your patterns. This is a good time to play with any pattern and multi-colored threads! After stitching the patterns, lay a 3.5 inch diameter plate (use anything!) covering your pattern. Trace around it. 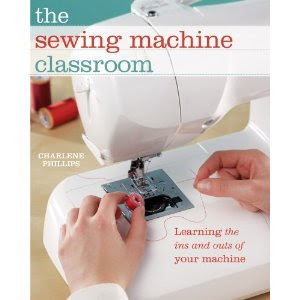 Remove the flower stitcher from your machine and place on your open toe/applique foot. Choose a nice stitch pattern and sew along your traced circle. 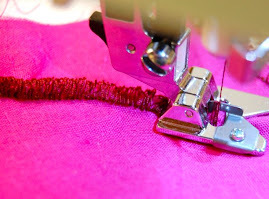 Using pinking shears, cut close to the stitch. Try several circles! Just have loads of fun! This attachment differs from the Circular Stitcher. The circular stitcher will usually make circles up to even 10 inches and does not attach directly to your presser bar. 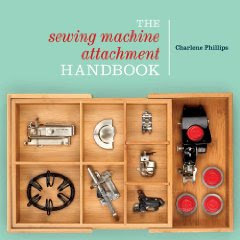 The Circular Stitcher is also more machine specific. 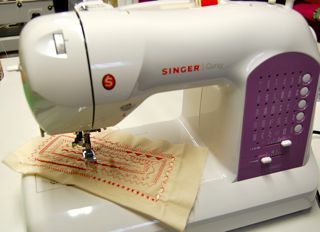 There are some for Pfaff machines, Babylock, and Singer. There are vintage and brand new ones. Know of others? Let me know. Please buy carefully as many are machine specific. We have just added the Flower Stitch attachment as part of our store inventory. You can find it in our low shank section at www.thesewbox.com.